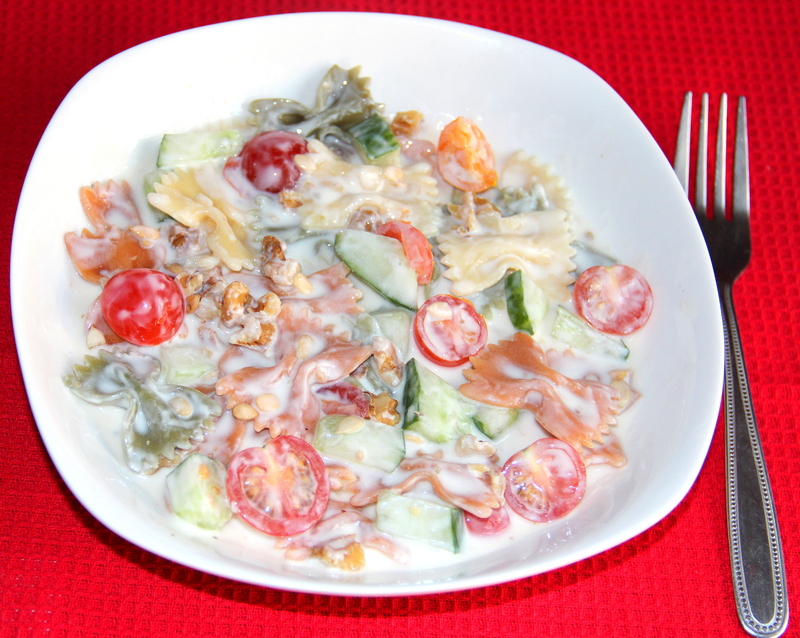 Pasta salad with lemon yogurt dressing which is creamy and tangy replaces mayo-based dressing. With yogurt in this dressing, the salad is lighter and the flavours come through better; It is a healthy alternative to traditional salad dressings. In a medium bowl, combine yogurt, honey, Lemon juice, salt, crushed pepper mix well. Add tomatoes, cucumber, onions, Pasta toss well and place in a bowl/plate. Top it up with Walnuts and Melon seeds. For variation you can use zucchini, bell pepper or any veggies of your choice. Posted on July 16, 2014, in International, Salad/Wraps, Soups, Salad and Wraps and tagged Chitras healthy kitchen, drchdietfood, Pasta Cold Salad, Salad in healthy yougurt. Bookmark the permalink. 4 Comments.